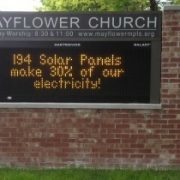 The 204 solar panels on the roof and front canopy are generating the equivalent of 30% of Mayflower’s electricity! The beautiful structural steel solar canopy, designed by Mayflower member Kurt Gough with Shelter Architects, is a prophetic witness to God and sends our message of carbon neutrality to the broader community. This solar installation, combined with our other Phase 1 carbon neutral efforts, results in an approximate 60% reduction in carbon emissions from our Mayflower facilities. 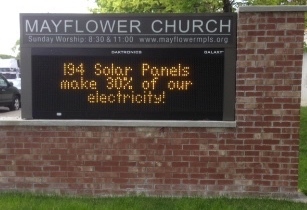 Read the Star Tribune’s story about Mayflower’s leadership.